The world is changing. And feminine power is on the rise. I get it, I’m a 6’5 white guy from Kansas who grew up in the upper middle class. Who am I to be talking about this? Well… I am the most unlikely person, but I’ve literally worked with tens of thousands of women and have a unique perspective as a man and a coach to offer up advice in this area. One of the biggest breakthroughs women have when they work with me is being able to claim their feminine and make peace with a lot of guilt/shame/hurt/harm that has been associated with their inner beauty/sexuality/creativity and worthiness. That’s exactly what me and my friend (and Mama Glow rockstar/doula and fellow Super Soul 100 member) Latham Thomas discussed on the podcast. >Click here to listen and check out it. >Click here to grab her new book: Own Your Glow. 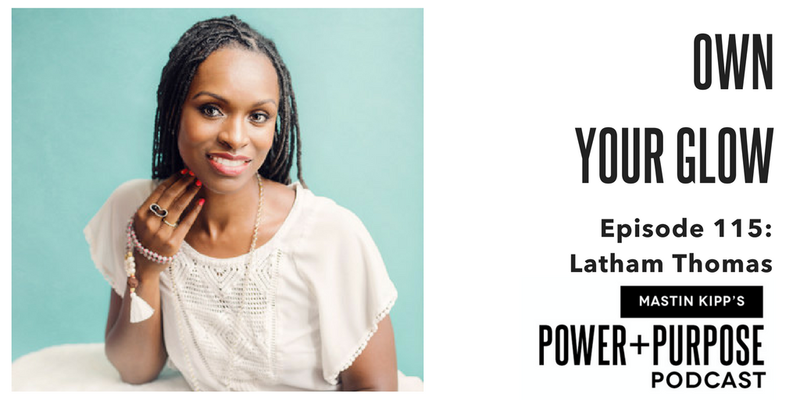 Latham is real, soulful and as a doula has an amazing perspective on how to operate from the feminine in a seemingly masculine world. NOTE: Feminine/Masculine are energies, not gender. We talk more about this in the podcast. With every life change comes fear. And a big fear is that of having enough funds. We ask questions like..
How can I make a change in my life without going through a period of financial insecurity? Given my current commitments, can I even find enough time to do this life changing stuff? There is a pay gap between men and women, why do I get paid less for the same job? How will I take care of my family/loved ones? How can I access enough money to be able to pursue my dreams? I’ve seen thousands of people go though this cycle. And, there is a step-by-step process you can follow to make sure your dreams are funded and your loved ones are safe. 1. Go from an “employee” mindset to an “entrepreneur” mindset. Instead of needing permission or thinking that your “time is money”. Realize that you don’t need a job… you just have to find a way to get financial resources to flow to you. Key to this? Look at a problem in the world you would love to solve and then start solving it. One of the big secrets of the entrepreneur mindset is that we know where there are problems, there is a business opportunity. Look at your current expenses with a “bootstrap” mindset. Cut costs that don’t serve your new direction and invest in trainings and tools to help you get to your goals faster. 2. Set a first version realistic new income goal. Most people don’t even have this, which makes the rest impossible. Know your first version goal. Sure, you want to make millions perhaps. But, what if you could start with $5 or $10k a month? Even an extra $2k a month, how would that change your life? If you don’t have a goal, you won’t hit it. You’ve got to get to $5,000 before you get to one million. 3. Build your Tribe by adding value (and sharing inspiration) consistently online. It really is that simple. When you consistently share and help online, you are seen as an authority. It’s no different that what you’re already doing, except you share it online. You’re already good at helping others, now let’s put that to work in a new and more profitable way. 4. Small Numbers Create Big Profits – Apply the 99/1 rule to your income. 99% of the income you want to create will come from 1% (or less) of your “Tribe”. I applied the 99/1 rule when I was couch surfing and actually learned how to make $10,000 from just 15 – 20 people. You don’t need a lot of people to replace your income. 5. Invite your tribe to work with you. The biggest barrier to most of our clients financial security is that they don’t invite their tribe to work with them. I know, crazy. Learn how to invite your tribe to work with you in a way that feels in integrity, that feels aligned with who you are and also feel really exciting and heartfelt to those you are extending an invitation to. There are usually a bunch of mindset mistakes people make when they are just getting started. – The think they can’t add value or inspire anyone. – They think they have to have some big audience before they can make a dime. – They think that these kinds of systems only apply to others, but not them. – They think they have to have it perfectly figured out ahead of time. – The think that they have to have some big fancy website that looks flashy, perfect and has all the bells and whistles. – They think that their tribe and working with people will drain their energy. – They don’t think it will last. – You have no idea how inspiring you already are. – I made my first $10,000 from 15 people. We’ve had clients make $50,000 from less than that. – You can apply this system to work for you…. it’s best not to do it alone. – You can still be confused and not 100% clear and replace your income at the same time. 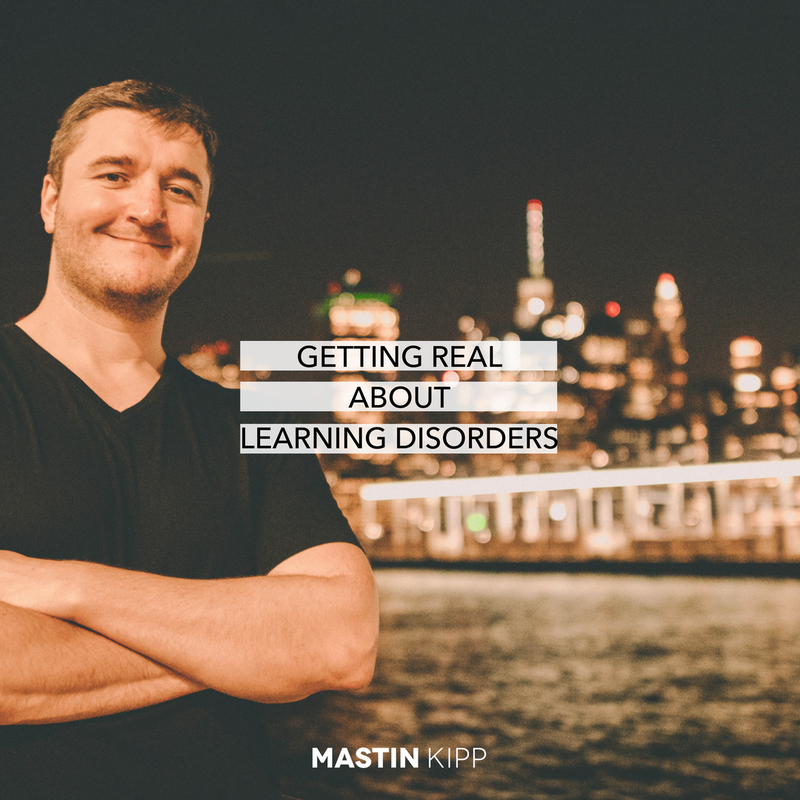 – I didn’t have a website when I started. And my first one was super ugly (major website shame). – Working with others to improve their lives won’t drain you, it will give you energy. – This can be your new life, for good. Now… all you’ve got to do is put this plan into action. You’ve got this. I’ve got you. Together, we can make this a reality. So, you think that you’re not creative? Life is a process of creation… whether or not you are aware of that fact does not matter. And, because life IS creation and YOU are a part of LIFE, you are also a part of that creation… which means that you must be like what you came from… which means that YOU are creative. Now, before you tell me why you think I’m wrong… pause for a moment and settle into the idea that YOU are a creative being. It doesn’t mean that you are Basquiat or van Gogh… don’t think of it in a such an extreme way. More it’s like this… Right now… you are creating your day. Your beliefs form your emotions; your emotions form your thoughts and your thoughts form your behaviors. Your beliefs, emotions, thoughts, and behaviors are filters through which you see the world. When you hear a news report that you don’t like, when someone says something that you don’t like on social media… when you feel inspired, jealous, happy, sad, joyful or otherwise… here’s the big secret. You are not experiencing LIFE in those moments… the thoughts, stories, emotions, and beliefs you are experiencing are YOU. So, right now… what you are feeling is YOU. And… you ARE creating your experience at this moment… and you are doing it consciously (meaning that you are aware of what you are creating) or unconsciously (meaning that you are unaware that you are creating this moment). The goal of your life is to discover and reveal all the ways you are unaware of that add to your current experience of life. This includes the stories, emotions, beliefs, etc. that are in you right now… forming this very moment. If you have a pain in your body, doctors like to do Xrays or other forms of research to see what’s going on inside. When this happens, they can determine the best next course of action. And – doctors who are on the cutting edge, Functional Medicine doctors, not only look for “what’s wrong” but they are also focused on getting to the root cause of what’s wrong and fixing that. You cannot fix an internal health problem with a symptoms-based approach alone. You must take a root cause based approach so that you can get to the source of the problem. As it is for your physical health, the same is true for your mental, emotional and spiritual health. You don’t know if your body being overweight is because of a fatty liver or because you are in a soul-sucking job that keeps you stressed out going to town on sugary foods. Or – maybe it’s both. You are in a soul-sucking job, which causes stress, which causes you to eat sugary foods, which causes fatty liver. So, the question becomes – why are you still in the job if it’s killing you? If you aren’t in a soul-sucking job, then view what I am saying metaphorically. Many times, we are in situations that we think are just related to our physical health, but as we are learning more and more each day, mental/emotional/physical and spiritual health are one in the same. So, consider today… that perhaps the deeper root cause of your stress, your stuckness, your tiredness, your problem… isn’t just physical/mental or emotional… maybe it’s also spiritual. If you are not creating what you are meant to create each day… that is a spiritual crisis… which leads to repression… which leads to depression… which leads to all kinds of other issues. Are there any gifts, creations, ideas, inspirations or projects that you’ve been wanting to do for a long while now that you aren’t expressing? If so, let me know what they are. And… when would NOW be the right time to get started on this project? (ahem…. NOW). What would be your first action step to get going? You are a creative being, born from creation itself… who has come here to give us something special, unique and that can only come through you. Don’t give up to the project… give in to your vision and get busy bringing it forward…. How do you eat a whole field of Kale? One bite at a time.. Take one step… one bite today. WARNING: Mercury Retrograde starts today…. I must say, I am very concerned that Mercury went into Retrograde today. And you should be, too. Why? Because until Mercury goes “direct” on December 23rd millions of people are going to give their power away to a planet that is 48 million miles away and completely ignore the power they have right here, not only on Earth, but within themselves to live an awesome life. Here’s the thing – worrying is a wasted emotion for the most part. Why? Because we worry about things we cannot control causing negative consequences in our lives. Here are some things you cannot control: Donal Trump’s Twitter account, Mercury going into Retrograde, your family, other people’s emotions/thoughts about you, the Stock Market, the price of Bitcoin, the Russian Investigation… your cat. Heck… you can’t even control your hair. 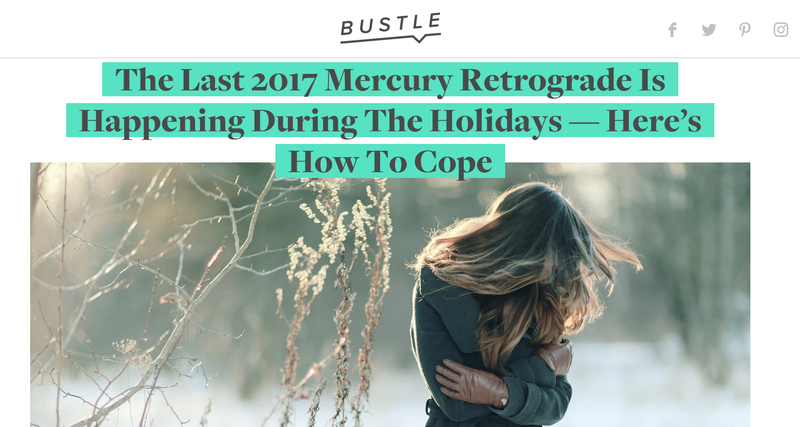 Rare is it someone who will say “Mercury is in Retrograde… but I AM NOT”. It doesn’t matter what the President is doing…. I am sending you a warning today to decide NOT to buy into the collective superstition that Mercury in Retrograde will mess up your life or break your tech. My tech breaks all the time, not just during Mercury in Retrograde. Don’t give your power away to something outside yourself. Behavior, Thoughts, Emotions, Beliefs and your OI. YOU and only YOU decide what this life means and how you will interpret the eventsof your life. There is no meaning to life or Mercury in Retrograde unless YOU give it meaning. Be less concerned with a planet 48 millions miles away and more concerned with your own ability to choose right here in your own body. Mercury is in Retrograde… BUT I AM NOT!